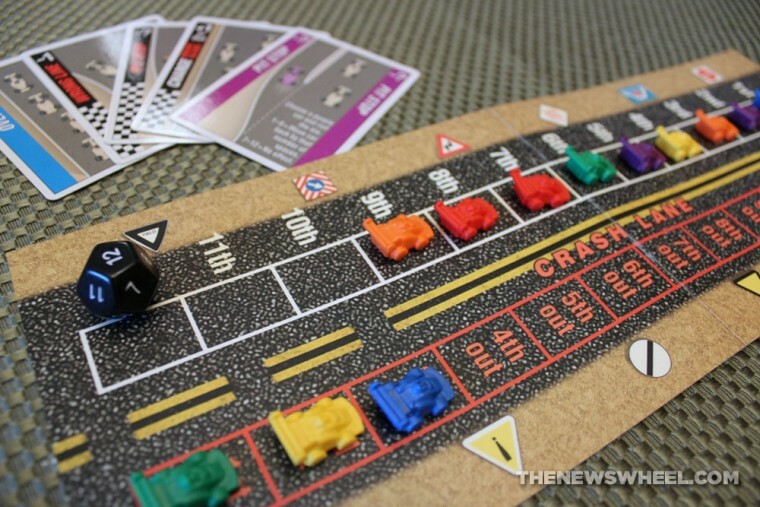 A racing-themed board game doesn’t have to be seriously involved or take a lot of time to play. There are times when you need a light, easy-to-learn title to fit your gaming fix, and that’s what Formula Motor Racing (FMR) aims to deliver. Love Simple Racing Games? Check out this pocket-sized, two-player F1 card game! Players win Formula Motor Racing by having the most points, which are obtained by their race results rank (from 10 points for 1st place to 1 point for 6th place). Regardless of how many players are involved, all 12 race car tokens (2 per color/team) are placed on the play mat. Starting order is determined based on pit crew identification cards being randomly drawn. Non-player-controlled cars still participate in the game. The deck of cards is shuffled and five cards are dealt to each player. Turns consist of a person playing a card from his/her hand, following the card’s directions, and drawing a replacement from the deck. Cars change position in the race through these cards, which allow cars to move up or down in the ranking–or be eliminated from the race. Cards can be played against a player’s own cars or an opponent’s; not all card actions may be successful, as some are determined based on a dice roll. The race concludes when the draw deck is exhausted. Points are tallied based on final podium position ranking. If players decide they want to play a second race, the deck is re-shuffled and the race continues with the current rankings (crashed cars being added back in). 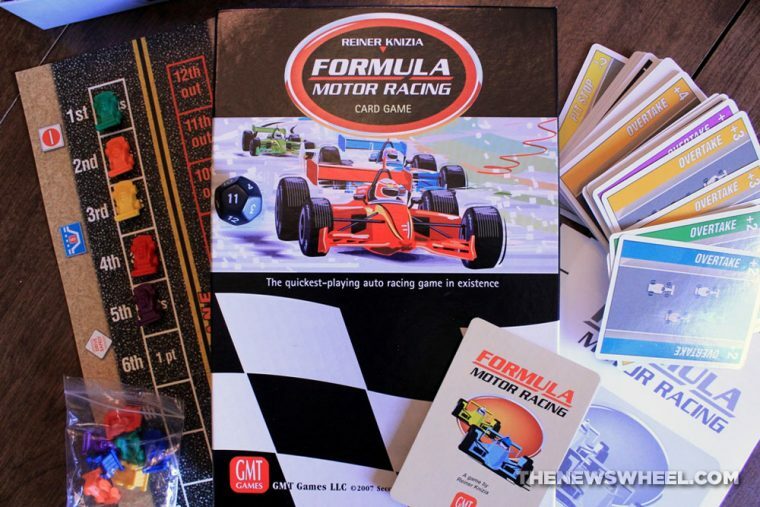 GMT Games is known for offering high-quality components for its titles, even in less costly ones like Formula Motor Racing. In spite of its low price tag under $20, this game comes with excellent plastic Formula 1 miniature car tokens that I’ll probably use for other racing games too. The play mat was added for the 2007 re-print and is a great way to keep the cars organized while adding to the aesthetic of the game. It folds in half, easily fitting into the box. The box itself comes with a plastic insert that keeps the components organized. The cards are thicker and stiffer than normal playing cards and stuck together for being shrink-wrapped for so long. This damaged the paint on them a bit, but after a couple shuffles, they were fine and easy to distribute. One issue that tripped us up multiple times while playing the game was the similarity between the yellow and orange colors on the cards–with orange looking more like a yellow-like goldenrod or dandelion. That caused multiple people to accidentally play the wrong cards, especially when they didn’t possess a yellow card to compare the orange to. We overcame this by leaving the pit crew cards within reach of all players to be used for consultation. A Gaming Classic: Have you ever played this beloved cross-country racing card game? 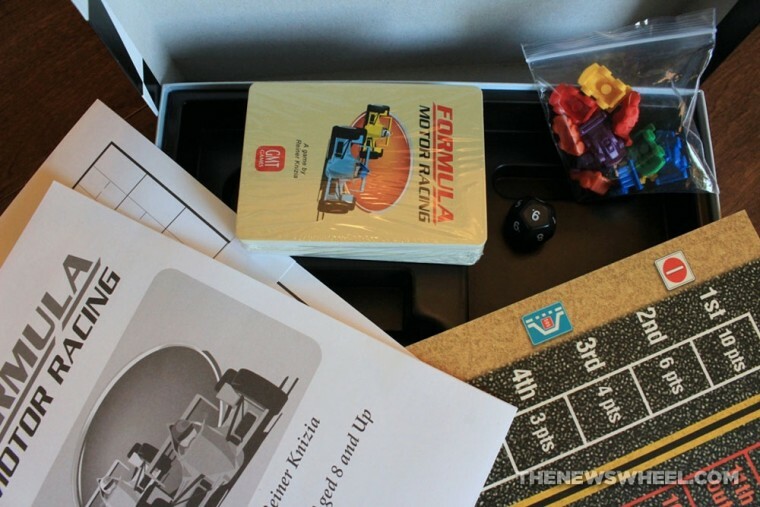 Formula Motor Racing markets itself as an easy-to-learn game, and the brief instruction booklet affirms that. Only two of the pages are dedicated to game play directions, with the others offering clarification on specific cards. Sections are divided into set-up, game play, and winning the game. Each section is relatively short and easy to grasp, even with the lack of accompanying images. When first learning the game, you will consult the directions multiple times to learn what each card does–as some cards don’t have instructional text printed directly on them–but once you learn, you won’t need to revisit the pamphlet. At that point, it’s easy to teach others to play without going back to the directions book. 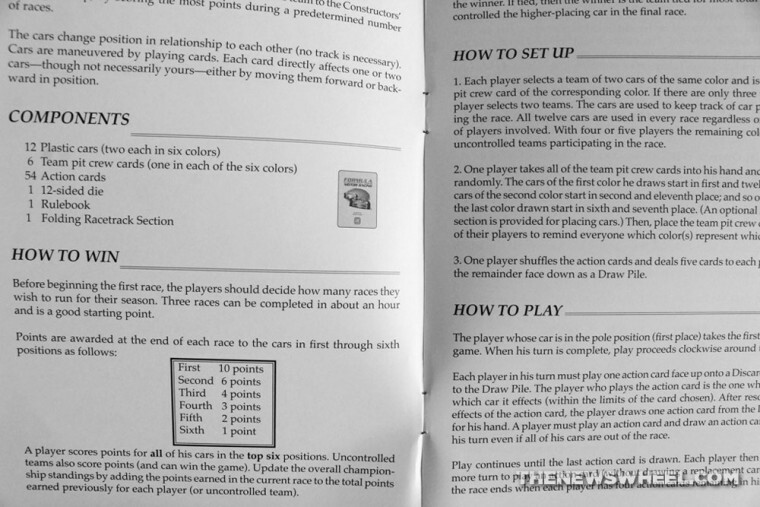 The booklet offers three variants on play, which don’t affect game play very much–merely shortening or lengthening the total game time. Formula Motor Racing doesn’t try to be the biggest, most intense tabletop racing game out there. 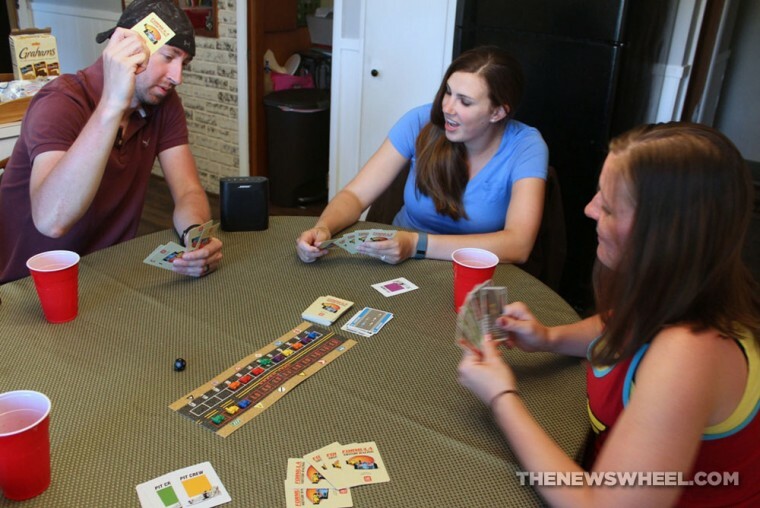 Instead, it fits a niche of–as its slogan says–“the quickest-playing auto racing game in existence.” Because of that, it’s best-suited as a filler game to open or close with on game night, or casually play over lunch at work. It’s easy to add players to the game by teaching them, as FMR is so simple and approachable. While that may frustrate hard-core gamers who might get bored with the simplicity and prefer a more involved experience, in all fairness, that’s not what Formula Motor Racing intends to be. It’s quick, small, and light–unlike so many other tedious racing games that take an hour of heavy game play just to complete one lap. It’s easy for children and adults to learn, and took our group only a couple minutes before developing a strategy (as much as you can while still depending on dice rolls). Each player having two cars in play at the beginning also keeps momentum going, even if one of them gets eliminated. The one element that divided our group was how each game involved every card from the same deck. Repeatedly using the same deck was a detractor for some players who wanted more surprises, while other players found it to be a chance to strategize more, knowing what cards were in the deck and holding onto the best until the end. I’ll admit that it feels like everything of consequence happens in the last couple minutes of the game, but that did make it more cutthroat. If you enjoy auto-racing board or card games, I highly recommend adding Formula Motor Racing to your collection. As long as you don’t exhaust its appeal by playing it too often, it’s a great filler game at a price. Formula Motor Racing is available for purchase through the publisher’s website, Amazon, Cool Stuff Inc, and other retailers.